The Chabad messianist flag. The Hebrew word is "Mashiach", meaning "Messiah". Chabad messianism, or Lubavitch messianism, generally refers to the passion among adherents of the Chabad movement regarding the coming of the Messiah and their goal to raise awareness that his arrival is imminent. In addition, the term also refers more specifically to the belief that Rabbi Menachem Mendel Schneerson is the Messiah. A few years before the seventh Rebbe's passing, members of the Chabad movement expressed their belief that the Rabbi Menachem Mendel Schneerson is the Jewish Messiah. These beliefs have been termed "Chabad messianism", and those subscribing to the beliefs have been termed Meshichists (messianists). A number of Jewish leaders have publicly voiced their concerns and/or opposition towards certain aspects of Chabad messianism. A chant recited by a number of Chabad messianists proclaiming Schneerson as the messiah is the "Yechi". Customs vary among messianists as to when the phrase is recited. Messianic beliefs concerning Schneerson vary a great deal. Controversy exists over whether he actually died and will be resurrected as the messiah, or whether he is simply "in hiding" until his final advent. To date, no study reports the number of Chabad Chasidim who hold these beliefs. The concept that the Messiah can come at any given moment is a basic tenet of Judaism. The idea that the leader of a Hasidic group could be the Messiah is a nuanced and complex idea that traces itself back to the times of the Baal Shem Tov, the founder of Hasidism. During Rabbi Schneerson’s life many Jews hoped that he would be the Messiah. This idea gained great vocal attention during the last years of Schneerson life. During those years, there were strong forces within the Chabad–Lubavitch movement, led by the two executors of Schneerson's will; Rabbi Yehuda Krinsky, and Rabbi Abraham Shemtov, resisting the messianic movement. Since the Rebbe's death, there are those who have persisted in the belief that Schneerson is still the Messiah, sometimes extremely vocally. Chabad messianists (meshichists) either believe Schneerson will be resurrected, or (a vocal minority) refuse to admit that Schneerson died, instead proclaiming that he is still alive. The Chabad–Lubavitch umbrella organization, Agudas Chasidei Chabad, and the governing body of Chabad–Lubavitch rabbis, Vaad Rabonei Lubavitch, have both denounced the messianic behavior. The issue received much negative attention. To this day it remains controversial. During Menachem M. Schneerson's life some of his supporters thought that he could be revealed as the Messiah. There were many Chabad Hasidim who proclaimed this very passionately. This concept, that a righteous Jewish leader may be revealed as the Messiah, was believed by many rabbis and scholars regarding their own leaders throughout Jewish history. This idea finds its earliest roots in an early 4th century discussion in the Talmud: After schools of various prominent rabbis each cite proof-texts that the name of the Messiah is indeed that of their very own teacher, Rabbi Nachman says, "If he [the Messiah] is among the living, he is someone like me." The Talmud then cites the sage Rav: "If the Messiah is among the living, then he is someone like our holy Rabbi [i.e., Rabbi Judah, the editor of the Mishnah]. [And] if he is from among the dead, he is someone like Daniel." Maimonides ruled the following as the definitive criteria for identifying the mashiach: If we see a Jewish leader who (a) toils in the study of Torah and is meticulous about the observance of the mitzvot, (b) influences the Jews to follow the ways of the Torah and (c) wages the "battles of God"—such a person is the "presumed mashiach". If the person succeeded in all these endeavors, and then rebuilds the Holy Temple in Jerusalem and facilitates the in-gathering of the Jews to the Land of Israel—then we are certain that he is the "actual mashiach". According to Maimonides there are two forms of the Messiah. The presumed messiah, known as the "Chezkat Mashiach" and the actual messiah, known as the "Mashiach Vadai". In addition, a number of Talmudic texts, and subsequent writings of Halachic authorities, speak of this that in every generations there is always one person who is worthy and has the potential of being the Messiah, and will redeem the Jewish people, should they be deserving. This third form of the messiah is referred to in halachic writings as the Mashiach shebador, meaning the messiah of the generation. According to the Chatam Sofer: "In every generation there is one righteous man (tzaddik) who merits to be the Messiah... and when the time comes, God will reveal Himself to him and send him." According to Rabbi Chaim Hezekiah Medini, not only is there such a figure in each generation, but this figure was sometimes explicitly identified as such. "They assumed who it [Messiah] may be... Rabbi Judah the prince... in his generation they said and knew that it was he who was worthy... and [he goes through a few other generations and then adds] based on this the disciples of the Arizal wrote that in his time it was him. All this is simple and straightforward." Anticipation for the coming of the Mashiach, and belief in the imminent arrival, has been on the hearts and minds of Jews through the past two millennia. Maimonides ruled that all Jews must believe with perfect faith, each day, that the Mashiach will come and the resurrection of the dead will take place. He rules that anyone who does not believe this, denies the entire Torah. The Chafetz Chaim, Rabbi Yisrael Meir Kagan, wrote "our days are the days of Messiah’s coming. Hear my brothers and friends; these are the days of Messiah. It is clear that our days are the days of Messiah’s coming," and Rabbi Moshe Feinstein, wrote that "we are obligated to anticipate the arrival of the Messiah on any given day as a near certainty." Hasidim in general, focused very much on the Mashiach and future redemption. In a vision in which Baal Shem Tov, the founder of Hasidism, encountered the Mashiach, the former asked the latter when he will come. The Mashiach answered "when your teachings [of Hasidism] will be spread forth". Many Hasidic discourses speak of the need to refine the world and prepare it for its ultimate perfectness when the Mashiach will come. Throughout Hasidic history, there have also been numerous cases of Rebbes that have been identified by their Hasidim as worthy of being the Messiah. These figures were not thought of having been the actual Messiah, since the criteria that must be fulfilled by the Messiah have been clearly stipulated by Maimonodes. Followers hoped that it would be their leader who would be the Messiah and occasionally spoke of him as the Messiah. As with other Chasidic groups,[page needed] Chabad Chasidim had a history of hoping that their Rebbes would be the Messiah. Schneerson himself spoke of his father-in-law, Rabbi Yosef Yitzchok Schneersohn, as the mashiach of his generation. In addition, the Chabad Rebbes often spoke with great passion about the coming of the redemption and the Messiah's imminent arrival. In a speech in 1942 Rabbi Joseph Ber Soloveitchik, praised the efforts of the Chabad Lubavitch campaign to raise awareness to the coming of the Masiach. Rav Soloveitchik said, "The Lubavitcher Rebbe speaks and publicizes about the Mashiach and a tumult has erupted, an uproar and an outcry. What is wrong, I ask? That people who are heretics decry him; I understand. That those who violate the Shabbat decry him; I understand. But that those who study the Talumud and Chassidus decry him; this is inconceivable...Are we not allowed to talk about the belief in the Mashiach anymore?" After the passing of his father-in-law Yosef Yitzchak Schneersohn, his gravesite, known as "the Ohel," became a central point of focus for Menachem Mendel Schneerson, who would visit it regularly for many hours of prayer, meditation, and supplication for Jews all over the world. The then seventh Rebbe of Chabad, Menachem Mendel Schneerson, openly declared his deceased father-in-law, the former Rebbe of Chabad Lubavitch, to be the Mashiah. Until today, followers of Chabad Hashkafa imitate the manners of their deceased seventh Rebbe Menachem Mendel Schneerson. After Rabbi Yosef Yitzchok Schneersohn died in 1950, his son-in-law, Rabbi Menachem M. Schneerson, soon became the seventh Rebbe. The Rebbe was a passionate believer in the coming of the mashiach. In a letter to Israeli President Yitzhak Ben-Zvi, Schneerson wrote: "From the time that I was a child attending Cheder, and even before, the vision of the future Redemption began to take form in my imagination -- the Redemption of the Jewish people from their final Exile, a redemption of such magnitude and grandeur through which the purpose of the suffering, the harsh decrees, and annihilation of Exile will be understood." Rabbi Schneerson also encouraged people to focus on Messiah very much. Beginning with his very first farbrengen as Rebbe, he spoke of this generation's mission to complete the Dira Betachtonim, and urged everyone to do all within their power to help the world reach its ultimate state of perfection, when Godliness and goodness will be naturally apparent and prevalent, with the final redemption. Schneerson would finish almost every public talk of his with a prayer for the imminent arrival of the Messiah. As early as the 1970s, he sought to raise awareness of the Messianic age by encouraging people to learn and become knowledgeable in the laws of the Holy Temple, laws that will only apply when the Messiah actually comes. In this connection, he quoted from earlier rabbinic opinion that learning about the redemption would raise awareness of and could actually bring the Messiah sooner. Rabbi Schneerson would frequently quote the many sages who stated that this generation was the last generation of the exile and would be the first generation of redemption and would quote the Chafetz Chaim and others, who stated that actively asking for the Messiah's coming is crucial. As Schneerson's passion about the need for Messiah became more well-known, criticism also built up. In 1980, a group of children from a Chabad summer camp composed a song with the words "am yisrael [nation of Israel] have no fear, Moshiach will be here this year, we want Moshiach now, we don’t want to wait." Rabbi Schneerson seems to have received great satisfaction from the children's initiative, and greatly encouraged their song. In light of some criticism about the insistent tone of these words, on one occasion he explained "This has always been the hope and yearning of the Jewish people – that the Messiah should come now, immediately. Therefore it is inappropriate for someone to say that he does not want, or that he does not agree, or that he is not comfortable that people are imploring 'we want moshiach now.' Each Jew clearly prays and pleads three times a day in the amida, while standing before the Al-mighty (at that time a person is certainly speaking the truth, and saying what he means) et tzemach David avdecha me’hera tatzmiach [that we merit the final redemption and coming of the Messiah speedily], and then continues ki lishuatcha kivinu kol hayom, that he hopes for this the entire day!" Schneerson urged and talked about purifying all parts of the world through Torah and Mitzvahs in order to bring Mashiach. Many he would weep publicly about the deep slumber and exile we are in, and how urgent it is that God redeem us, both for our sake as well as even for His own. Nevertheless, criticism of his passion about the coming of the Messiah and, his urging people to do all they could to bring about the redemption by adding in the observance of Torah and Mitzvahs, was something that was known to him. On one occasion he even remarked "I have merited that the complaint people have against me is that I am passionate about the Mashiach." Many Chassidim of the seventh Rebbe, Rabbi Menachem Mendel Schneerson felt that he is the Mashiach of the generation, even though he never said so himself. According to research by Rachel Elior, the belief that the Rebbe would be the messiah built up during the 1980s. She asserts that messianism can be traced back even to the previous Lubavitcher Rebbe, but cites evidence that the 1980s saw an upsurge. Nevertheless, this hope was initially kept to a hush. Rabbi Shalom Dov Wolpo brought up the issue in 1984 by publishing a booklet declaring Schneerson to be the Messiah. Schneerson responded by banning the publication and forbidding Wolpo from involvement with any Messiah related topics. Wolpo would later argue that despite the Rebbe's strong opposition, "everyone must still consider and proclaim the Rebbe as the Messiah" arguing that "acceptance of the Messiah must be done by the people not by the King". As the years went on, and recognition of Schneerson as being so toweringly unique, a Rebbe of truly unprecedented and universally recognized stature, spread ever further, this Messianic speculation spread to greater numbers and higher volume than in previous generations. The chasidim became vocal of their hope that Schneerson would be the one to be the Messiah. Rabbi Chaim Bergstein was quoted[where?] as saying "I'm not saying he is or isn't Mashiach, but there is no one as learned ... in this generation." Time magazine journalist Lisa Beyer reported that Rabbi Adin Even-Yisrael said he wished that Schneerson should be revealed as the Messiah." Even Rabbi Yehuda Krinsky told The New York Times in 1988: "Our sages tell us that the Messiah is a man of flesh and blood who lives among us... If I were asked in this generation who was the most suitable, beyond any question, in my mind, it would be the Rebbe." Some Chabad Hasidim took their message to the streets with billboards declaring that it was time for the Messiah to come and bring the redemption. The first record of Hasidim referring to Schneerson in messianic terms was in 1965. That year, Rabbi Avraham Parizh printed letters that spoke of Schneerson as the Messiah and started handing them out in Israel. When Schneerson learned of this, he immediately dispatch a telegram to Parizh in Israel saying that he was "shocked by the letter [you wrote and disseminated]" and asked that Parizh "immediately cease distributing it." Schneerson instructed Parizh to "gather and send to all extant copies of the letter, every last one, and please confirm immediately that you have fulfilled this instruction." In 1984 Sholom Dov Wolpo published a booklet identifying Schneerson as the Messiah. Schneerson publicly denounced these actions several times. During one of these talks he said that those involved [in the publication] were starting a new war against Chabad, and that he should never have to speak about it again. On Shabbat Bereshit, when Wolpo began singing a song that had long been popular in Lubavitch, which referred to Schneerson as the messiah, he abruptly stopped the singing and ordered that it never be sung again. In 1991, Rabbi Aharon Dov Halprin, the editor of Chabad’s Israeli magazine (Kfar Chabad) prepared an article that explained why the Rebbe was worthy of being considered Messiah. When the Rebbe got word of this he responded sharply, "If you, God forbid, [plan to] do anything even remotely similar, it is preferable that you shut down the periodical completely". On a number of occasions Schneerson said that Rabbis should issue a psak din that Moshiach must come. In 1988 Rabbi Yitzchak Hendel issued a ruling stating, not that the Messiah must come, but that the Rebbe was to be the Messiah. When the Rebbe saw the ruling, he responded to Hendel and wrote "me’heichan dantuni? (- a Talmudic term connoting: on what basis have you ruled against me?) Is this the standard of all your rabbinic rulings!?" In the late 1980s and early 1990s Schneerson's talks became increasingly focused on the topic of Moshiach, that Moshiach was about to come, and what was needed to accomplish this. These talks would often take on a sense of urgency. This, coupled with Schneerson's frequent statement that ours is the "Last Generation of galut (exile) and it is the first generation of Geulah, the redemption" is one of the arguments put forward[by whom?] that the Rebbe is the messiah. On one occasion, during the Rebbe's talk at the International Conference of Shluchim ("emissaries"), he stated, "the work of the Shluchim has already finished, and the only task left is to welcome Moshiach". In the early 1990s Hasidim became more vocal about Schneerson being the Moshiach, even submitting a petition to him asking that he reveal himself as the long-awaited messiah. On one occasion in 1991, as the Rebbe was leaving the evening prayers when traditionally someone would start a song and the Rebbe would encourage it on his way out of the synagogue, some Chasidim began singing one of the Rebbe’s favorite lively songs, adding the words of Yechi -- "Long live our master, our teacher, our Rebbe, King Moshiach." The next morning, however, the Rebbe refused to go down to the synagogue until he was assured by Rabbi Groner that there would be no such songs sung again. Indeed, the song was never again sung in front of the Rebbe until some months after a stroke felled him and removed his ability to speak or write. A few months later, a few people did muster the courage to start singing at an intermission in a Shabbos farbrengen a less overt song that implied that the Rebbe was the messiah. Within a few seconds the Rebbe heard it and immediately became very grave and said: "Really, I should get up and leave [the room]. Even if some people consider it is not respectful that I need to [be the one to leave], I don’t need to reckon with the views of a small number when [what they are saying] is the opposite of reality. However, first of all, it will unfortunately not help anyway. Secondly, it will disrupt the shevet achim gam yachad [brethren to dwell together in unity], for if I were to leave, others will leave, too." In 1992, a journalist from Israel said to the Rebbe, "We appreciate you very much, we want to see you in Israel; you said soon you will be in Israel, so when will you come?" The Rebbe responded: "I also want to be in Israel." The journalist insisted, "So when, when will you come?" The Rebbe responded, "That depends on the Moshiach, not on me." The journalist persisted, "You are the Moshiach!" to which the Rebbe responded, "I am not." On March 2, 1992, while praying at the Ohel, the site where his father-in-law is buried, Schneerson suffered a massive stroke. That very evening, while he was being treated for his stroke and Chabad Chassidim around the world gathered for prayer, some of the messianists broke out in song and dance. It was during this period of illness and inability to communicate that the messianic movement reached its greatest fervor, and became more vocal of their hope that Schneerson would soon be the Mashiach. This also troubled many people who felt that it was being imposed upon Schneerson as something he had no control over. In the fall of 1992, a special balcony was constructed on the upper level of the synagogue at 770 Eastern Parkway overlooking the main sanctuary to allow Schneerson to participate at the daily prayers. It soon became customary for many chassidim to recite the Yechi after prayer to which Schneerson made encouraging motions with his left hand (his right side had been paralyzed by the stroke). On certain occasions; the Rebbe made increasingly big signs of either encouragement or displeasure such as on Rosh Chodesh Kislev 1992 (5753); when the Rebbe moved his hand back and forth with extreme energy. During the next two years, the messianists began publicizing their message on television and in newspaper advertisements. Some of Schneerson's collected speeches from the previous two years of his life were collected into pamphlets and published under the title Besuras Hageula. These especially were distributed by the messianic chasidim in an effort to bolster the case that he would be the Messiah despite his illness and that the coming of the Messiah is imminent. Such publications was used to bolster the hope that Schneerson would be the Mashiach. By late 1992, with much talk of Schneerson as the Messiah, a movement to formally crown Schneerson as Messiah gained prominence. Rabbi Shmuel Butman announced his plan to crown the Rebbe. The Rebbe, who had been paralyzed and speechless since March the previous year, would join the daily prayers on a special balcony that was built for him to easily be wheeled. Butman planned to crown the Rebbe on January 30, 1993 after the evening prayers. However, when the Rebbe got word of the planned event, he communicated to his secretaries Leibel Groner and Yudel Krinsky that he would only attend for the usual evening service. Both Groner and Krinsky, then followed by Butman, announced that the event was actually not a coronation and should not be intended as such. However, his view was not shared by all. Some of the messianists were so caught up with their hope, that they interpreted each new erosion in the Rebbe's health, and ultimately his very death, as stages in the messianic process. They cited various midrashic statements to fuel their ecstasy as to the imminent revelation of the Messiah, and some of them drank and toasted l’chaim and danced before and during the funeral - an act that shocked many admirers of Schneerson across the Jewish world. And in the days after Schneerson's death, many journalists and pundits wrote how they expected the end of the movement. For many Chabad followers, the death of the Rebbe was extremely painful. He was laid to rest next to his father-in-law, at the Ohel, at the Montefiore cemetery in Queens. In Jewish tradition, significant dates are frequently referred to by their Hebrew characters. Chabad (like other Jewish movements) dating back to their first Rebbe, Rabbi Shneur Zalman of Liadi, dates of all their Rebbes' deaths by Hebrew dates. Thus, in the case of Schneerson, the anniversary of his death became known as "Gimmel Tammuz" (the third of Tammuz). For many hopeful, often vocal, followers, Schneerson's death did not rule out the hope that he could still be the Mashiach. There are Talmudic and Halakhic sources that speak of the possibility that a righteous Jewish leader could be resurrected to become the Mashiach. These positions, although not well-known, figure quite prominently and early in authentic Judaic sources. The Babylonian Talmud states: "If he [the Messiah] is among the dead, he is someone like Daniel." In fact, the most well-known deceased figure identified as being able to be the Messiah is King David. Not that he is the Mashiach, but that he perhaps could be. As the Jerusalem Talmud states: "The Rabbis say, who is King Messiah? If he is from the living, David is his name, if he is from the deceased, David is still his name." According to Rabbi Moses Margolies, a commentator on the Jerusalem Talmud known as the Pnei Moshe, the Talmud rules that: "If he [the Messiah] is among the living, David will be his name, and if he is from among the dead, he is David himself". Other rabbinic sages object to the notion that Mashiach will be someone who had once lived, died and was then resurrected. As Maimonides writes: "Even if one is worthy of being Mashiach, if he is killed it is certain that he is not Mashiach." Subsequent to Schneerson's death, vocal messianists have continued to proclaim that Schneerson is still alive. Some of them argue that just as the talmud states that "Jacob did not die" a teaching that carries great nuanuced significance in kabalistic thought, so too "Schneerson did not die". Among religious Jews, reference to one who has died is followed by expressions such as alav hashalom or zechuto yagen alenu. Messianists do not use such terms when writing of Schneerson. Some messianists have even continued to use terms that indicate that Schneerson is still alive such as shlita. Generally speaking, the majority of this group consists of very vocal Israeli youth, particularly those educated in the city of Safed. There are also members of the messianic camp within the Crown Heights community and elsewhere who share these views. These individuals can usually be identified by the small yellow pin, known as the Moshiach flag worn on their lapel (or hat), and the Hebrew words of "Yechi" emblazoned on their kippot. Since Schneersons death, Beis Moshiach magazine has been a major organ for views within this camp of the messianist. Between the years 1998-2004, the messianists have garnered support from rabbis to issue a Rabbinic ruling supporting their messianic claims. These views have led to much controversy and condemnation. Regardless of Schneerson's death, the majority of Chabad Chassidim continue to see him as the most righteous Jewish leader of the time, the nasi hador, whose influence throughout the world remains very palpable. They acknowledge that he died, visit his grave and observe yahrtzeit. They tend to place little or no emphasis on whether or not the Schneerson will be mashiach. Instead they focus on actually trying to carry out and fulfill Schneerson's vision of making the world a better place. They are aware of Schneerson's negative reactions when people tried making Messianic claims about him, and are acutely aware of how much Schneerson, their tzaddik ha'dor and their moshiach sh'b'dor, expects of them to accomplish both in the realm of their own personal service of God, in helping to bring the beauty of Judaism to Jews, and to spread the beauty of monotheism to the world at large. They hold that they have no way of knowing who will be the Moshiach, although they may wish it will be Schneerson. According to some scholars, the messianist divisions in Chabad can be identified by various subtler factions of those who claim the Rebbe is not the messiah but could have been as he had all the qualities of a messiah prior to his death, whether the Rebbe was the messiah and will be messiah again once resurrected, whether the Rebbe is believed not to have died or is believed to be God. A private sign in Crown Heights. The greatest criticism of chabad messiansim was leveled by Professor David Berger. In a series or articles that were later published in his book The Rebbe, the Messiah, and the Scandal of Orthodox Indifference, Berger argued that there is no source in Jewish theology for the concept that a Messiah will come, begin his mission, only to die, and then be resurrected to complete his mission. As a result of this, Berger argued that Chabad Messianism, which he claimed was prevalent in majority of Chabad and its largest institutions, was beyond the pale of Orthodoxy and perhaps even heretical. His positions sparked much controversy in the Jewish world during the late 1990s and early 2000s. In his book he documents his efforts to mobilize other rabbis and rabbinical organizations to delegitimize Chabad. He concludes by recording his great frustrations in not being able to achieve this. Messianism is not advocated in any of Chabad's official literature. According to Rabbi Shmotkin, the Chabad spokesman, Chabad-Lubavitch leaders have "repeatedly condemned them [messianists] in the strongest possible terms". Journalist Sue Fishkoff notes that the idea that most Lubavitchers are messianist is "a claim that is patently absurd. Here everyone is treading on thin ice, for no one can know precisely how deep Chabad messianism goes. When Berger and other critics claim that it affects the majority of the Chabad movement, they have no greater statistical backing than do those who suggest it is on the decline." The reaction of many Torah scholars to the idea that Schneerson could be the Messiah varied. During his life, numerous rabbis and Jewish leaders, expressed their views that Rabbi Menachem Mendel Schneerson had the potential to be the Messiah of the generation. There has been a general decline in that view since his death. Among those who stated that Schneerson had the potential to have been the Mashiach, one finds Dr. David Berger, who despite a sharp polemic against the vocal messianic movement that has pursued since Schneerson's death, has written that while he was alive "Judaism has never had a serious messianic candidate with the curriculum vitae of the Rebbe zt"l. Virtually all the accolades heaped upon him ... are true." at the root of the matter, the concept of Messianism attached itself to the Rebbe because of his image and status – their positive aspects. The Rebbe embodied – and in a powerful way – a certain combination in which one who wished to could see the reflection of a reflection of the Messiah King. Dr. Norman Lamm, also said of Schneerson that "If [people] believe the Rebbe could have been Moshiach, fine, I agree... He had a far better chance than most." Although once the Rebbe died, he didn’t see that as a possibility. Lamm also argued that messianists had misinterpreted Schneerson's statements to create a "distortion" leading to "moral nihilism." According to Lamm open efforts to declare Schneerson the messiah were not tolerated before his death: "When he was alive, no one would have dared to discuss this. But now it is easy for the messianically-oriented to distort the Rebbe's teachings". Long time critics of Schneerson from Bnei Brak in Israel, have been the most vocal in their criticism of Schneerson and Chabad. The most notable of these critics was Rabbi Elazar Shach, the Rosh Yeshiva of the Ponevezh yeshiva. Shach was a known critic of Schneerson and the Chabad movement and he repeatedly attacked Schneerson and his followers on a number of issues, including messianism. When people became more vocal about the possibility of Schneerson being the Messiah, Shach advocated a complete boycott of Chabad. Other Bnei Brak leaders, including Rabbi Chaim Shaul Karelitz, the former av bet din of the She'erit Yisrael Kashrut organization of Bnei Brak, Rabbi Yaakov Weinberg, a rosh yeshiva of Yeshivas Ner Yisroel, have also all spoken negatively of those who wish Schneerson would be the Messiah. In America, numerous Litvish leaning rabanim have also spoken negatively of this form of messianism, including Rabbi Elya Svei, Rabbi Aharon Feldman, of the Ner Israel Rabbinical College, Rabbi Shlomo Miller, a Rosh Kolel (dean) of the Kolel Avreichim Institute for Advanced Talmud Study in Toronto and head of its Beis Din, Rabbi Moshe Heinemann, Rav of the Agudath Israel of Baltimore and the Star-K, and Rabbi Chaim Dov Keller who all issued harsh criticism. Even if one is worthy of being Mashiach, upon his death it is certain that he is not Mashiach. Feldman claims that anyone that can believe that the last Lubavitcher Rebbe is worthy of being the Messiah has as a "compromised judgment" and is "ignorant of Torah." Other American torah authorities, such as the Ungvarer Rav Rabbi Menashe Klein, Rabbi Moshe Heinemann of the Agudath Israel of Baltimore and the Star-K kashrus, the posek Rabbi Yehuda Henkin, Rabbi Chaim Brovender and Rabbi Ahron Soloveichik argue that while there may be sources for messianism, it is a shtut (foolishness) that should not be followed. Before the passing of the Rebbe, I included myself among those who believe that the Rebbe was worthy of being Moshiach. And I strongly believe that had we, particularly the Orthodox community, been united, we would have merited to see the complete Redemption. Insofar as the belief . . . that the Rebbe can still be Moshiach, in light of the Gemara in Sanhedrin, the Zohar, Abarbanel, Kisvei Arizal, S’dei Chemed, and other sources, it cannot be dismissed. Soloveichik adds that "any cynical attempt at utilizing a legitimate disagreement of interpretation concerning this matter in order to besmirch and to damage the Lubavitch movement that was, and continues to be, at the forefront of those who are battling the missionaries, assimilation, and indifference, can only contribute to the regrettable discord that already plagues the Jewish community, and particularly the Torah community." But a 2000 letter from Soloveichik states that there have been those who have "persisted in stating that I validate their belief that a Jewish Messiah may be resurrected from the dead. I completely reject and vigorously deny any such claim. As I have already stated publicly. . . My intent in signing the original letter . . . was merely to express my opinion that we should not label subscribers to these beliefs as heretics." 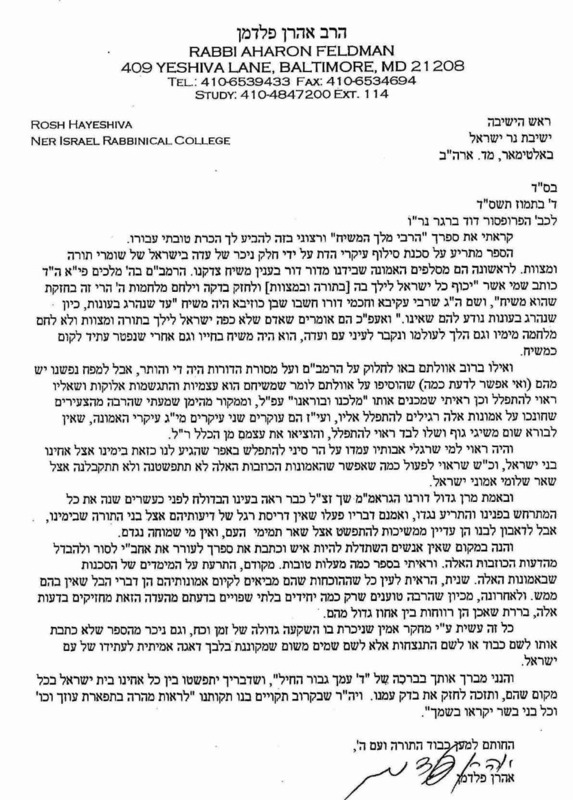 Between the years 1998-2004, a Rabbinic ruling supporting the messianic claim that the Rebbe is the Moshiach was issued and signed by over 100 rabbis. In January 2000, the Chief Rabbinate of Israel released a statement regarding the issue of Schneerson being worthy of being the mashiach, and declarations made by messianists, saying that such declarations "confuse and mislead simple people." The statement continued to mention that the Chief Rabbinate "[has] no intention, God forbid, of diminishing the greatness and the global activities of the Rebbe of blessed memory." A conversion case in 2007 of a man educated by Chabad messianists who wished to convert led to controversy, with two Israeli rabbis saying the messianic views were "beyond the pale of normative Judaism" and the man should therefore not be allowed to convert. The Chief Rabbinate ruled in favor of the conversion. 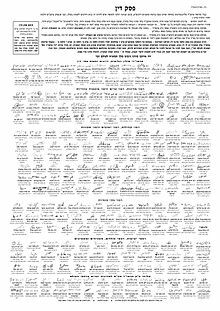 A statement from Agudas Chasidi Chabad said: "With regard to some recent statements and declarations by individuals and groups concerning the matter of Moshiach and the Lubavitcher Rebbe, Rabbi Menachem M. Schneerson, of sainted memory, let it be known that the views expressed in these notices are in no way a reflection of the movement's position. While we do not intend to preclude expressions of individual opinion, they are, in fact, misleading and a grave offense to the dignity and expressed desires of the Rebbe. "The Rebbe clearly inspired a heightened consciousness of Moshiach, one of Judaism's principles of faith, and towards this end, encouraged the study of the traditional sources concerning belief in Moshiach, the Redemption and its imminent fulfillment, as well as an increase in activities of goodness and kindness. This should be perpetuated by all, as we strive for a more perfect world and the fulfillment of the Rebbe's vision." Philosopher Rabbi David Hartman expressed his concern about the developing messianism early on, while Schneerson was still alive, saying that "the outpouring of Messianic fervor is always a very disturbing development." Senior Reform Rabbi and humanitarian activist Arthur Lelyveld was also scathing about the messianist trends within the Chabad movement describing the organisation as having a "cult like" atmosphere. Such comparisons make many Orthodox Jews uncomfortable. Scholar Mark Winer has noted that "The Lubavitcher movement's suggestions that their late Rebbe Menachem Mendel Schneerson is the Messiah, reflect Christian millenarianism." Anthropologist Simon Dein has noted: "Lubavitchers held that the Rebbe was more powerful in the spiritual realm without the hindrance of a physical body. However some have now claimed that he never died. Several even state that the Rebbe is God. This is a significant finding. It is unknown in the history of Judaism to hold that the religious leader is God and to this extent the group is unique. There are certain Christian elements which apparently inform the messianic ideas of this group." There have been non-Chabad Jewish figures have expressed their concurrence with the belief that Schneerson is indeed the Messiah. Ya'akov Yosef, (son of Rabbi Ovadia Yosef), Aaron Leifer, the late Rabbi of Nadvorna-Safed, Eliyahu Shmuel Schmerler, rosh yeshiva of Sanz and member of the Mif'al Hashas, Ahron Rosenfeld of the Pinsk-Karlin Hasidic dynasty and Yaakov Menachem Rabinowitz of the Biala Hasidic dynasty, all signed a 1998 halachic decree ruling that Schneerson is the Messiah. "Yechi Adoneinu Moreinu v'Rabbeinu Melech haMoshiach l'olam vo'ed!" (יחי אדוננו מורנו ורבינו מלך המשיח לעולם ועד) is a phrase used by messianist Chabad Hasidism to proclaim that Schneerson is the messiah. It translates as "Long Live our Master, our Teacher, and our Rabbi, King Messiah, for ever." The phrase can be seen printed in various settings, notably on pamphlets, posters and small cards and keyrings. It is chanted by messianists at the end of daily communal prayers in Lubavitch congregations, including the main Lubavitch synagogue in Crown Heights, "770". Yechi began as the phrase "Yechi Adoneinu Moreinu Verabbeinu," ("Long Live our master, teacher and Rebbe!") to which the response was a shout of "Yechi" ("May he live!"). It appears to be based on the statement made by Bathsheba, the wife of King David "Yechi adoni hamelech David le'olam," ("May my lord King David live forever!") (Kings I 1:31). When used by Lubavitcher Hassidim, it was originally recited in the presence of Schneerson after twelve special verses known as "the Twelve Pesukim" whose recitation the Rebbe encouraged in his teachings. ^ a b also: Habad messianism, Lubavitcher messianism, mishichism, meshichism. ^ Susan Handelman (July 1, 2014), The Lubavitcher Rebbe Died 20 Years Ago Today. Who Was He?, Tablet Magazine. ^ Ruth R. Wisse (2014). "The Rebbe Twenty Years After". Commentary Magazine. Retrieved 30 December 2014. ^ a b Berger, David (2008). The Rebbe, the Messiah, and the scandal of orthodox indifference (1. pbk. ed.). London: Littman Library of Jewish Civilization. ISBN 978-1904113751. Retrieved 16 June 2016. ^ The full text is "Yechi Adoneinu Moreinu v'Rabbeinu Melech haMoshiach l'olam vo'ed" ("Long Live our Master, our Teacher, and our Rabbi, King Messiah, for ever and ever). ^ Elliot R. Wolfson. Open Secret: Postmessianic Messianism and the Mystical Revision of Menahem Mendel Schneerson. Page 19. ^ a b c d "Rav Aharon Lichtenstein's Hesped for the Lubavitcher Rebbe - English". Retrieved 23 December 2014. ^ See section "Before Schneerson's Death"
^ Josepf Telushkin Rebbe; page 413. ^ Bruni, Frank (February 25, 1996). "To Some, Messiah Is the Message;Media Campaign for Late Rabbi Divides Lubavitch Movement". The New York Times. Retrieved February 26, 2015. ^ See: "After Schneerson's Death". ^ Josepf Telushkin "Rebbe"; page 420. ^ a b Susan Handelman (1 July 2014). "Who Was the Lubavitcher Rebbe?". Tablet Magazine. Retrieved 23 December 2014. ^ Rambam. Hilchot Melachim, Laws of Kings. 4. ^ Friedman, Tzvi. "What is Chassidut?". Chabad.org. Retrieved 17 September 2016. ^ Yitzchak keller, Moshiach Bedor, 1991. ^ a b Eisenstein, Yehuda (1907). Otzer Yisroel. ^ Bar-Hayim, HaRav David. "The False Mashiah of Lubavitch-Habad". Machon Shilo (Shilo Institute). Retrieved 17 June 2016. ^ Bar-Hayim, HaRav David. "Habad and Jewish Messianism (audio)". Machon Shilo (Shilo Institute). Retrieved 17 June 2016. ^ "Who Was the Lubavitcher Rebbe?". Tablet Magazine. Retrieved 23 December 2014. ^ a b Adin Steinsaltz, My Rebbe, page 173. ^ a b c d Chabad's Messianism and Israeli Radicals. Azure no. 41. ^ "Expecting the Messiah — An Ultra-Orthodox sect says the Redeemer is due to arrive any day now — and he might be an American" Time magazine, Lisa Beyer, March 23, 1992] (paywalled). ^ "Hasidic Group Expands Amid Debate on Future". 5 September 1988. Retrieved 23 December 2014. ^ Cheshbono shel Olom page 56. ^ "Chabad's Messianism and Israeli Radicals". Retrieved 23 December 2014. ^ "Rabbi Schneerson Led A Small Hasidic Sect To World Prominence". 13 June 1994. Retrieved 23 December 2014. ^ "What Really Happens When Prophecy Fails: The Case of Lubavitch." Dein, Simon. Sociology of Religion, 9/22/2001. ^ a b Berger, David (April 1, 2008). The Rebbe, the Messiah, and the Scandal of Orthodox Indifference. Littman Library of Jewish Civilization. ^ Jaffe, Melech. "A Brief History of Lubavitch Messianism". ^ Berger, David (2001). The Rebbe, the Messiah, and the Scandal of Orthodox Indifference. Littman Library of Jewish Civilization of Portland. p. 42. ^ a b "Halachic Ruling". Psak Din. Retrieved March 22, 2014. ^ Sarah Maslin Nir (13 September 2013). "Jews Make a Pilgrimage to a Grand Rebbe's Grave". Retrieved 13 January 2015. ^ "Who Was the Lubavitcher Rebbe?". Tablet Magazine. Retrieved 13 January 2015. ^ "Rabbi Telushkin's Newest Book on the Lubavitcher Rebbe: A Testament to Greatness". The Huffington Post. Retrieved 13 January 2015. ^ Dein, Simon, and Lorne L. Dawson. "The ‘scandal’of the Lubavitch Rebbe: messianism as a response to failed prophecy." Journal of Contemporary Religion 23, no. 2 (2008): 163-180. ^ Jonathan Mark (November 14, 2007). "Chabad Gathering: No Jew Left Behind". The Jewish Week. Archived from the original on March 9, 2008. ^ Mark, Jonathan. "Chabad's Global Warming". The Jewish Week (December 2005). . An online version of this article can be found at "Speeches said at and Articles about the International Conference of Chabad Lubavitch Emissaries, Address by Professor Alan Dershowitz, Harvard University". Archived from the original on May 7, 2007. ^ The Rebbe's Army: Inside the World of Chabad-Lubavitch by Sue Fishkoff, p. 274. ^ "Article « The Rebbe Twenty Years After «Commentary Magazine". Retrieved 23 December 2014. ^ Berger, David (2001). The Rebbe, the Messiah, and the Scandal of Orthodox Indifference. Littman Library of Jewish Civilization of Portland. p. 7. ^ The Rebbe, The Messiah, and the Scandal of Orthodox Indifference, David Berger, The Littman Library of Jewish Civilization, 2001. pg 105. ^ Berger, David (2001). The Rebbe, the Messiah, and the Scandal of Orthodox Indifference. Littman Library of Jewish Civilization of Portland. p. 85. ^ a b The Rebbe, the Messiah, and the Scandal of Orthodox Indifference by David Berger, 2001, published by the Littman Library of Jewish Civilization of Portland. Page 70. ^ HaRebbi Melech HaMoshiach, David Berger, Urim Publications, 2005. p.75, note 7. ^ Hatzofeh, 11 Shevat 5760 (18 Jan. 2000), 5. The Rebbe, the Messiah, and the Scandal of Orthodox Indifference by David Berger, 2001, published by the Littman Library of Jewish Civilization of Portland. Page 128–129. ^ Avishai ben Hayiim (December 26, 2007). "Rabbinical Conversion Court refuses to convert Chabad messianist". Maariv (in Hebrew). Retrieved December 21, 2014. ^ The New York Times, Feb 9, 1996. ^ Messianism and Christianity, Joel Marcus, Boston University School of Theology Studies, 2001 - Cambridge Univ. Press. ^ "פסק דין". Archived from the original on March 3, 2016. Telushkin, Joseph (2014). Rebbe: The Life and Teachings of Menachem M. Schneerson, the Most Influential Rabbi in Modern History. Harper Collins. ISBN 978-0062319005. 2002 Irresponsible Slander, Prager, Dennis, Moment Magazine. The Jewish Messiahs: From the Galilee to Crown Heights, Harris Lenowitz, University of Utah, 2nd ed. (Oxford, 2001). Salvation or Destruction? The Meaning and Consequences of Lubavitch Messianism, Kraut, B., Shofar: An Interdisciplinary Journal of Jewish Studies, Volume 20, Number 4, Summer 2002, pp. 96–108. Jewish Messianism Lubavitch-Style — an interim report, William Shaffir, Jewish Journal of Sociology 35 (1993) 115–128.